» Ads on Illegal Signs: Who’s the Responsible Party? 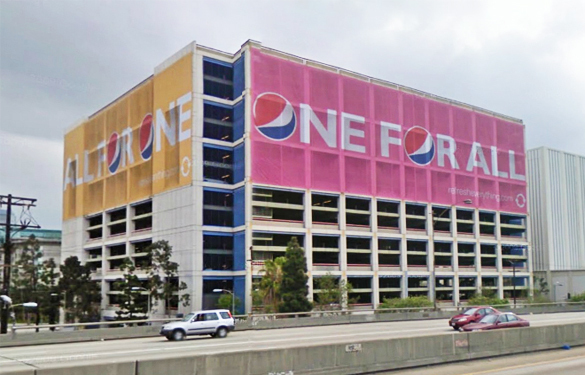 Until recently, southbound motorists on the 110 freeway near the L.A. Convention center were greeted with huge fabric Pepsi signs draped over two sides of a seven-level parking garage. On Highland Ave. in Hollywood, an even larger Pepsi sign hung from the side of a historic building housing a film archive, dominating the view from blocks away. And for several months, the familiar Pepsi logo adorned a building alongside the 405 freeway in West L.A.
Pepsico, the largest food and beverage company in North America, makes much of its adherence to rules of conduct designed to assure that its products are marketed in a responsible way. Does this “responsibility” include making sure that Pepsico products aren’t advertised on illegal signs? Obviously not, because the sign companies and property owners at those locations have been charged with multiple violations of the city’s sign code, including failure to obtain required permits and inspections. Those signs have been removed, and the company that erected the “supergraphic” sign on Highland Ave. has agreed to pay the city a $4 million penalty for violations there and at other locations in the city. The company responsible for the signs on the downtown parking structure, Van Wagner Communications, and the sign on the 405 freeway, World Wide Rush, have been sued by the city, but the cases are still pending in Los Angeles County Superior Court. 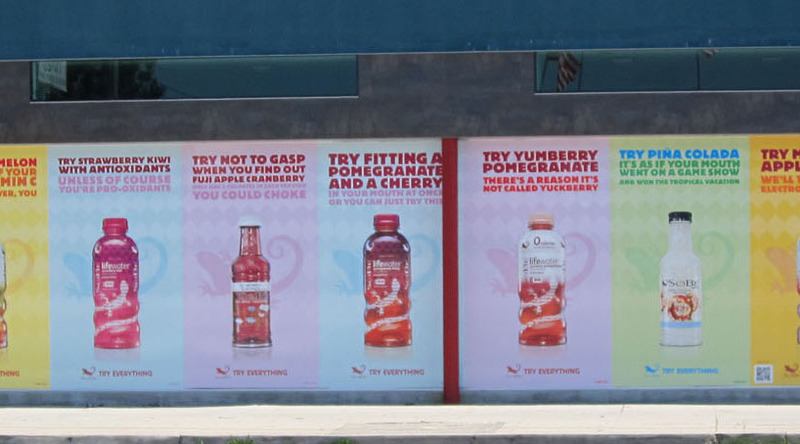 This news has either failed to reach Pepsico headquarters and the offices of agencies involved in marketing its products, or putting up signs with no regard to their legality is just considered normal business practice, because new supergraphic signs (see right) advertising Pepsico’s “SoBe Lifewater” have recently appeared around the city. Pepsico is hardly unique. Such major corporations as Apple, Chase Bank, Hewlett-Packard, and McDonald’s, to name just a few, have advertised on illegal supergraphic signs in L.A., many of which blocked windows, creating fire hazards and obscuring the views of people working inside. And faceless, multi-national corporations aren’t the only culprits; the L.A. Dodgers “Mannywood” campaign of two years appeared on a number of large supergraphic signs erected without permits. Pepsico proclaims its adherence to the Code of Advertising and Marketing Communication Practice issued by the International Chamber of Commerce, which lays down rules of conduct regarding marketing and advertising. Still, some might ask if the presence of a sign stretched across the face of unoccupied building, or a film storage facility, or a parking structure, is really worth making a fuss about, even if it’s technically illegal. Some local journalists–the architectural critic for the L.A. Times and the editor of the L.A. Business Journal, to name two–would not doubt answer in the negative, since both have publicly disparaged anti-sign activists and others who have supported City Attorney Carmen Trutanich’s aggressive enforcement of sign laws against companies that operated as they had carte blanche to turn the city’s buildings into giant ads. We would point out that in another court case involving a supergraphic sign wrapped across a parking structure in West L.A., city fire officials testified about how the sign could block the escape of toxic smoke from a car fire, and potentially endanger the lives of others in the facility. As for the sign on the film archive building, it actually came loose one windy day and fell into the street, although no injury or property damage resulted. If these kinds of situations damaged property, and caused injury or even death, who would step forward to take responsibility? Who would explain why marketing soft drinks was so important it justified disregard of the city’s laws?